Larry Evans, Assistant to the General Conference President for the Deaf and Special Needs Ministries, talks about what has been accomplished and what is still left to do in reaching people around the world with a wide range of special needs. Question: You were appointed as assistant to the world church president for Special Needs Ministries in September 2015, when this ministry was created. What has been your major focus over the last two-and-a-bit years? Answer: The work for the Deaf and Special Needs Ministries has three major components. We refer to them as our “3-A Strategy:” Awareness, Acceptance, and Action. 2. Acceptance – Acceptance includes seeing those with special needs as individuals and, second, the mission to reach them with the Adventist message of hope. My first concerns for the deaf developed while in the Oregon Conference. At that time, there were about six or eight workers in the North American Division for the deaf, and all were paid differently. In that number, there was one full-time hearing pastor for the deaf. Today, that number has decreased to one denominationally employed pastor for the deaf (he is himself deaf). There is also one full-time supporting minister for the deaf. 3. Action – The actions taken for the deaf and now for Special Needs Ministries is an educational approach — not a medical one. The majority of the deaf do not see themselves as being “disabled” but rather as being part of a unique culture with its own language. What major accomplishments can you point to so far? A name was created (Adventist Deaf Ministries International – ADMI) with input from the deaf community. A logo was created with the input from the deaf community. A division deaf coordinator was chosen by each of the 13 divisions to lead out in the development of the work for the division. The second largest baptism of the deaf in the history of the denomination on a single Sabbath – 131 in Kenya. The first denominationally-sponsored booth regarding deaf ministry at a General Conference Session (2010) plus the first “broadcast” of American Sign Language for the deaf at a General Conference Session via Hope Channel. In November 2016, the launch of Hope Channel Deaf. The first denominationally-sponsored school for the deaf on the continent of Africa was opened in Kenya. Two other schools exist — one in India and one in the Philippines. “I saw that it is in the providence of God that widows and orphans, the blind, the deaf, the lame, and persons afflicted in a variety of ways, have been placed in close Christian relationship to His church; it is to prove His people and develop their true character. Angels of God are watching to see how we treat these persons who need our sympathy, love, and disinterested benevolence. This is God’s test of our character. If we have the true religion of the Bible, we shall feel that a debt of love, kindness, and interest is due to Christ in behalf of His brethren; and we can do no less than to show our gratitude for His immeasurable love to us while we were sinners unworthy of His grace, by having a deep interest and unselfish love for those who are our brethren, and who are less fortunate than ourselves.”—Testimonies for the Church 3:511. Special Needs Ministries has been defined to include the deaf, the blind, those with mobility issues, those with cognitive/developmental challenges, orphans/vulnerable children, and caregivers (which now includes ministry for widows). We have created a special taskforce of experienced people for each of these six ministries. This is not limited to the concept of “disability” though it is not denied. This ministry is not about what a person cannot do. This is a ministry about “possibilities,” about “inclusion” in every ministry of the church. It is about helping each person find a “vocational calling” in which they too can serve. What other changes have been made in the way Special Needs Ministries has been organized? Each of the 13 Divisions has chosen a Special Needs Coordinator. Divisions are holding orientation and training sessions for Union leaders, who in turn provide training for conferences and local churches. At the General Conference, we have a Special Needs Committee made up of all General Conference department heads, plus lay leaders. As part of the reorganization, Christian Record Services for the Blind is now a North American Division entity while the General Conference Special Needs Ministries for the blind now covers the world field outside of North America. The new arrangement is being reviewed, but we do plan to work as partners for the blind. We have instituted an annual Special Needs Sabbath with Sabbath School programs and sermons to increase awareness. This year it falls on April 21. We have created a new logo, new motto, and new resource-rich website at www.specialneeds.adventist.org. You have lots going on! Any other recent milestones you can point to? We just facilitated (through donors) the purchase of a braille embosser to serve a thousand blind in Ghana! That embosser with shipping costs over $16,000 but will provide the only literature for these blind — both Adventist and non-Adventist. Imagine the mission opportunity this has. What has been the most challenging or difficult thing in your role? It varies from division to division, but lack of awareness is a real challenge. We need leaders, pastors, and church members to recognize the need to give priority to this ministry. Some don't understand the difference between a “disability” ministry and a “possibility” ministry. We need more staff and volunteers for this expanding ministry. There is a desparate need for more interpretors and pastors for the deaf. We also have financial pressures to deal with. We have had a large one-time gift by a gracious anonymous donor. But now that the ministry has expanded, we hope funds will be allocated by the General Conference. The GC already pays my salary and travel expenses. We are approaching this ministry as a “movement” – not a program! We seek to build understanding and enthusiasm that will spread globally and cross-culturally. This is a key concept behind all that we do. Therefore, we approach this wholistically, taking advantage of all the resources available through the General Conference departments. I believe you have spent a great deal of time traveling to different divisions around the world promoting awareness and inclusion of people with physical and mental limitations. Where have you spent the most time? What differences in attitudes have you found toward special needs ministries in different countries and cultures? I go where I am invited. Most invitations come from Africa, Inter-America, South America, Philippines, and some in Europe. I visited 16 countries this year. We must educate the future generation regarding this compassionate and enabling/empowering ministry. I am scheduled to speak in four or five colleges outside North America this year, hopefully with a team, and making use of the educators at each institution. The attitude among most division leaders is amazing. Some division presidents have asked each of their unions to appoint a Special Needs Ministries coordinator. Kindness is contagious. A blind lady in Romania asked what she could do to help. She offered to translate an English book written about ministry for the deaf into Romanian, and she did! In one way, serving in a new role is an easier experience because you have no previous procedures and conventions you are forced to follow. But it is also harder because you have to create and develop the job, informing stakeholders and creating awareness. How do you like being the first person in this role? It’s like planting a new church (which I have done). It is exciting and exhausting at the same time. This ministry is not just a job for me. I firmly believe that caring for others is at the heart of “Revival and Reformation.” Serving in this role was never on my career radar, but I feel it is a prophetic ministry. As John the Baptist worked to prepare the way for Jesus’ own ministry, so we too must rid the valleys of despair, flatten the mountains of impossibilities and exclusion, straighten the curves that often eliminate those with special needs and level the bumps that leave feelings of rejection. Given the emphasis of Jesus to this very ministry, I can’t imagine Him leaving those with special needs behind and without hope or a future. I have been privileged to help get things started in a some new ways, but I am very much aware that I’m standing on the shoulders of many who have gone before me. In general, how have we as a church done at including people with special needs in the past? How can we do better? That all depends on one’s perspective. We all have “special needs.” We are all “broken” in some way. This ministry actually touches everyone in some way. But yes, there is much to do and to undo! Most have little idea of the prejudices that exist. People with special needs have not always been treated with respect. Some who may not appear or act in conventional ways have been marginalized. This must change if we are to be faithful to our gospel commission. Consider the following: The World Health Organization estimates that there are 1.1 billion people with some kind of discernible disability. There are between 70 and 350 million deaf people and 39 million who are blind. Today worldwide, approximately 240 million widows and 13 million children have lost both parents. There is enough need in the world for us to get our minds off ourselves, stop being offended by whatever upsets us, and reach out in compassion to those who need simple caring, gentle signs of acceptance, or a warm meal from time to time. While we may be doing some of these things already, we can always do better. Knowing what God has done for us, we will act out of a sense of grace rather than duty. Despite our size as a world church, at the local level resources are, of course, often stretched. How can we realistically expect to offer a wide variety of services and forms of assistance to people with a wide variety of needs? I learned a long time ago that the first question is not, “How much does it cost? But rather, what would God have me (us) do?” As one seminary professor once said, “You can’t give the right answer to the wrong question.” We start with what we have. This ministry had nothing to begin with. Elder Wilson caught the vision and has been very supportive. He called me to this position and put me on a number of key committees so that I would be able to get the word out to the church's world leaders. The biggest asset I had were the recognized needs — not money in the bank! I was given a small operating budget, but it came with many doors of opportunity. From that small beginning, many are now leading out in compassionate ministries. We started by making it clear that we did care, then a few doors began to open. I would be less than honest if I didn’t say that at times I still feel overwhelmed when I see the global needs. I feel very inadequate. It is painful to see needs and not be able to help in tangible ways. Sometimes doors do open right away, but sometimes not until later. Our Adventist schools have not traditionally been very good at catering to students with special needs. Is this likely to change? I’ve served twice as a conference president, and education was always a high priority on my agenda. I don’t have an answer except to say, there are times when we need to partner with the community. However, if the child must go to the public to find special education, I personally believe the church can still play a part in the spiritual welfare of the special needs student. I firmly believe in the three-legged stool of influence: home, school, and church. But we must remember, and please don’t overlook this: parents and guardians of special needs children also need support! There are places where Adventists have done exceptional work for children with special needs. I wish there were more. What major roles have you served in within the Adventist church? Did you ask to work in the area of special needs? What experience do you have working in this area? I've served in a number of roles, but whatever the role I have seen myself as a pastor. The first time I was the assistant to a president (this is my third time) one of my roles was that of being the multicultural director. It was during that time that I learned that the deaf are part of a “culture” and that they did not consider themselves disabled. Learning the difference was a critical point though I did not know at the time how important that would be decades later. My initiation to the deaf ministry began when I was working in Oregon. A deaf pastor was sitting in a pastors’ meeting and obviously not getting anything out of it. Afterward, I took him to my office, and we began typing to each other on a TTY machine that had a very small LED screen. I did my best to review what we had discussed in the meeting. That was how it began. I went to campmeetings for the deaf and saw hearing parents taking care of their deaf children, and I saw deaf children trying to relate to their deaf parents. I could not erase that from my mind. Years later when I was the Undersecretary of the General Conference those memories came back. The role of the Undersecretary is a heavy one with many organizational and policy details to attend to. I remember praying that the Lord would remove those concerns because I had some important work to get done. He changed the job but not the passion. What has had the greatest impact on you during the last two years in this job? What is the biggest thing you have learned? I think of the severely crippled man with cerebral palsy in Romania as an example of the the kind of impact this work has had on me. He can hardly speak. He drools, and his body moves very awkwardly and in ways that frustrate him. Yet, I’ve learned he is a national chess champion and capable of playing multiple chess games at the same time. What have I learned? I’ve learned why Ellen White said, “It is in the providence of God that widows and orphans, the blind, the deaf, the lame, and persons afflicted in a variety of ways, have been placed in close Christian relationship to His church.” Last year, I went back to Romania where I held some evangelistic meetings for those with special needs. The man with cerebral palsy made his decision to be baptized, but in reality he was one of many teachers who opened my eyes. When I look at my ministry, the church of today, and those with special needs, I’ve learned that we should never try to write the conclusion to a book (a life) when God is still adding chapters. Many get frustrated with the slowness of the church to act in specific ways. I can get very impatient with the slowness of pastors and members for not recognizing the feelings of hurt and the sense of rejection by those with special needs. But I’ve also come to realize that I need to do what I can where I am at the moment. A new chapter will come. I must start where I am and where the church is. When that happens, the Lord is able to bless our endeavors in ways we never thought possible. See www.SpecialNeeds.Adventist.org, www.AdventistDeaf.org, and www.HopeChannelDeaf.org for more information. 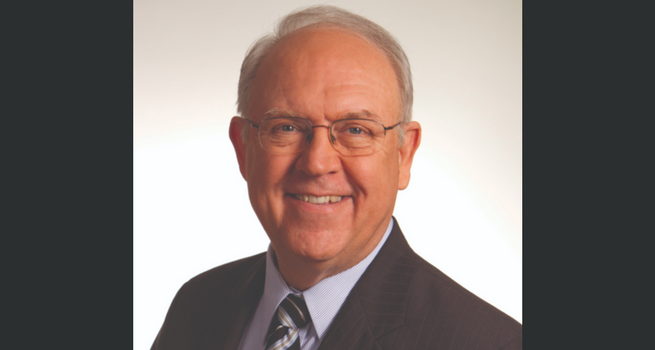 Larry Evans, Assistant to the General Conference President for the Deaf and Special Needs Ministries, has served in a number of capacities including church pastor, a church planter, a pastor for pastors, a multicultural director, a conference secretary, and conference president. Prior to his current ministry in the General Conference, he served as the Assistant to the President for the North America Division and then as General Conference Undersecretary and Associate Stewardship Director. He helped organize what is now known as Adventist Deaf Ministries International. He received his Doctor of Ministry from Andrews University. He is married to Carolyn (Bigger) who works at the General Conference as an interdivision specialist in support of missionaries. They have two sons and five grandsons. Image courtesy of Larry Evans.